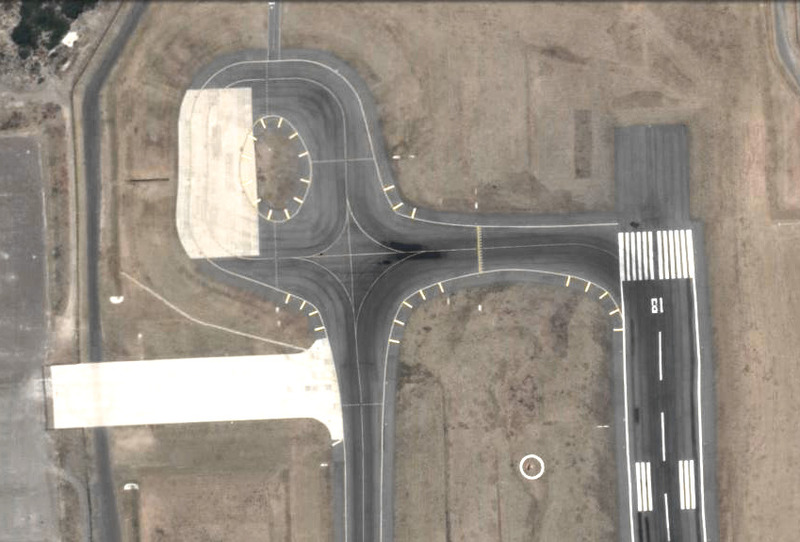 What is the purpose of the loop in the taxiway plainly visible in this image? 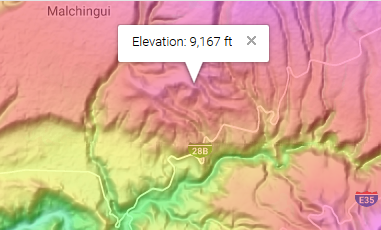 The airport's elevation is 7900 feet (verified by Skyvector), the first ridge in jwzumwalt's 2nd image is 6.4 miles distant from the north end of the runway and lower in elevation, and the second ridge is 8 miles distant but only 500 feet higher. 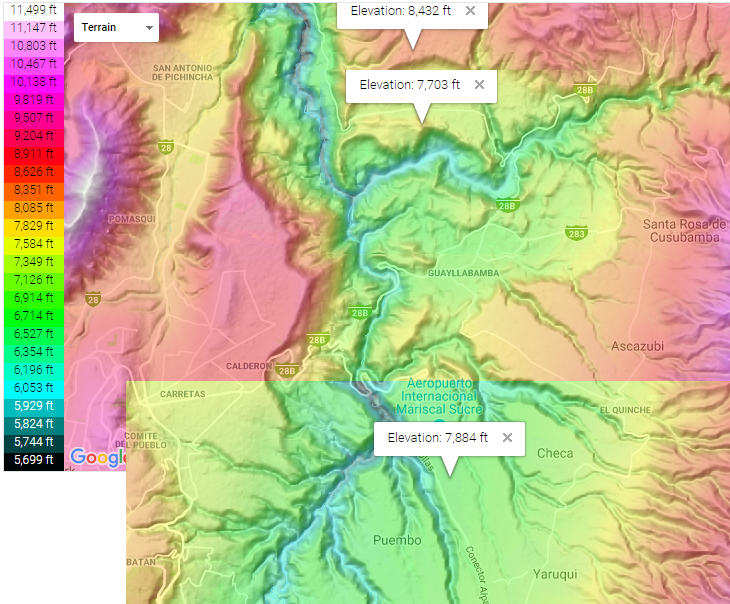 Distances verified by Google Maps. But, I do like jwzumwalt's answer. Thanks! In the US, this is called a "run up area". It is used by small piston powered airplanes to test their engine prior to takeoff. The circular design allows several aircraft to full throttle their engines without the prop blast hitting the aircraft behind it. It also allows other aircraft like a business jet, to pass the testing aircraft and takeoff immediately. Larger aircraft or turbine powered aircraft don't usually test their engines near taxi-ways and other aircraft (or aren't allowed). If they need to test their engines, a special blast "pen" or blast "barrier" is used. 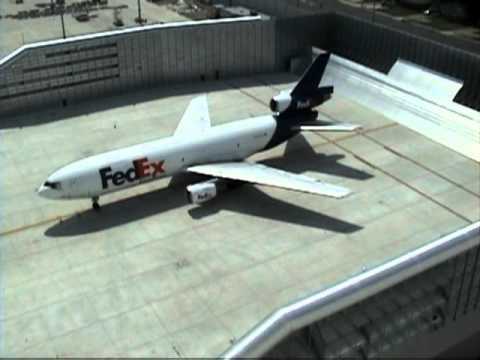 Youtube video of a FedEx engine test. 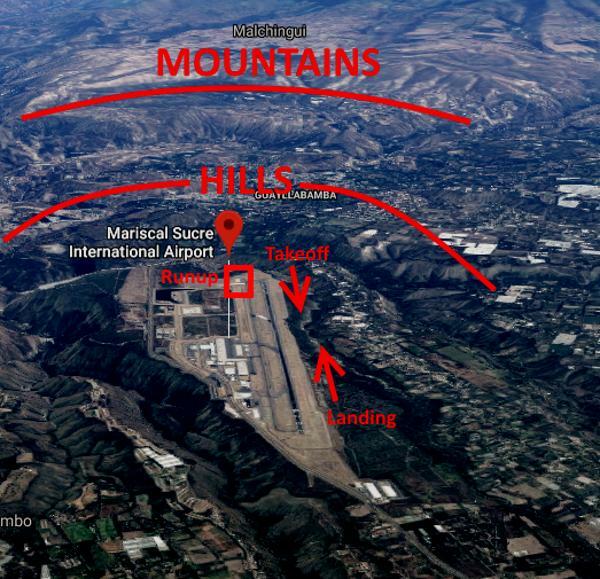 This Youtube video of a airplane landing shows a ground view of the significance of the hills and mountains off the departure end of 36. Also looking at the layout of the airport, it gives planes a holding area in case they need more time to get ready. If there was traffic behind them they would have to taxi down the runway until the mid-point and then back up the taxiway Quito is a high airport with some long haul flights.. take-off performance may be restricted and this may result in the plane being a bit overweight so this may be an area to allow for airplanes to burn-off some fuel. As an example the aircraft may have a restricted take-off weight of 280,000kgs. A forecast ZFW (weight without fuel or zero fuel weight) of 200,000kgs may be given to the crew. The crew may then decide to uplift 80,000kgs of fuel which would bring the take-off weight up to the allowed 280,000kgs. However as the forecast ZFW was only a forecast.. the actual ZFW may exceed due to last-minute passengers, cargo, baggage etc. If it is a big amount (more than 2-3000kgs) they would probably offload some cargo but if it was only 1,000kgs or so the crew may elect to burn off some fuel to get the legal weight before taking off. Not the answer you're looking for? Browse other questions tagged taxiing airport-design or ask your own question. What do taxiway lane, taxiway strip and taxiway shoulder mean? Which speed shall be used on high speed taxiway? How can two planes be on the same taxiway facing opposite to each other?